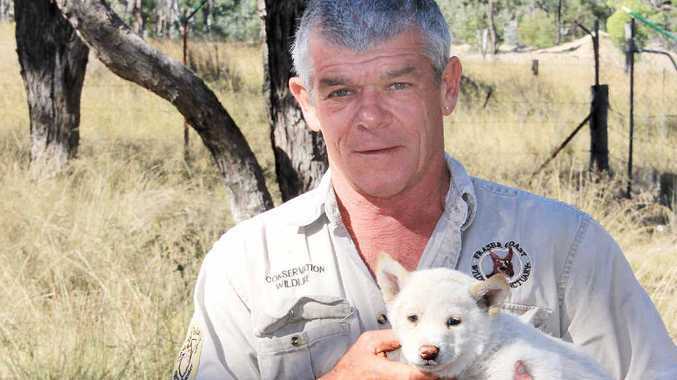 FIERCELY passionate wildlife crusader Ray Revill is over the moon with his latest arrival, a rare white dingo pup he has named Spirit. This comes on the heels of a recent and devastating loss of Ray's much loved Karla, his favourite dingo. Ray was so close to Karla that he had her image tattooed on his leg. Though Karla died of old age, her loss was still devastating to not only Ray but the whole crew at the Fraser Coast Wildlife Sanctuary. "We both knew the time was coming," Ray said. "She actually crawled on to my lap and laid her head down. Then she gave an almighty dingo howl and passed away in my arms." But the good news and arrival of Spirit, named after the Butchulla's Spirit dingo of Fraser Island (K'Gari) couldn't have come at a better time. Ray anticipates the Fraser Coast public will be able to view Spirit at the Discovery Centre on Saturday, but details are yet to be confirmed. There are four different types of dingo- Alpine, Desert, Tropical and Fraser Island. The scientific name is Canis Lupus Dingo. Dingoes are a sub-species of the grey wolf. Dingoes cannot bark, they howl.